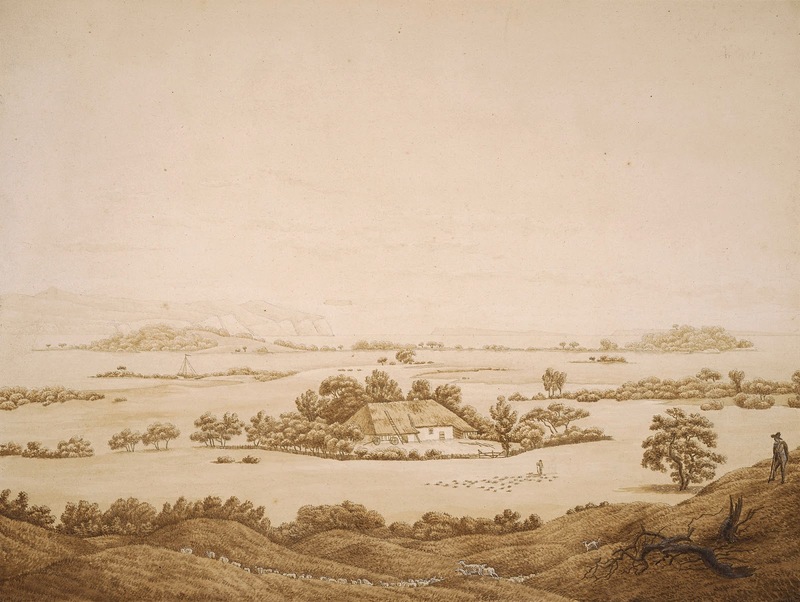 A Dialogue with Nature: Romantic Landscapes from Britain and Germany, at the Morgan Library through Sept 7, is a long title for a compact, stunning show of works on paper from the pinnacle of this somewhat forsaken genre. It feels as though landscape art has been stowed up in the attic for awhile, perhaps because its prevalence in the 18th through early 20th centuries exhausted its exploration. And this grouping of works, chosen from the collections of the Morgan and London's Courtauld Gallery and curated by Matthew Hargraves and Rachel Sloan, shows the sublime, daunting heights achieved. What peaks were left to conquer, in a way? Not only do representative works in the show display unsurpassed technique in accurately rendering elements of nature, their color, composition, and additional details reflect the visionary imaginations of this select group of artists. Many of the German artists, in the tradition of Dürer, wield a fine, descriptive line. Caspar David Friedrich exemplifies the romantic German perspective in Landscape on Rügen with Shepherds and Rocks (1809/10). The fauna—sheep, shepherd—are subsumed into the vales, and the edifice absorbed by the stand of trees. It is a peaceful, bucolic view of nature and man co-existing. The British artists seemed to have a way with the vagaries of moody weather and natural phenomena. Constable apparently recorded weather conditions and noted cloud formations. 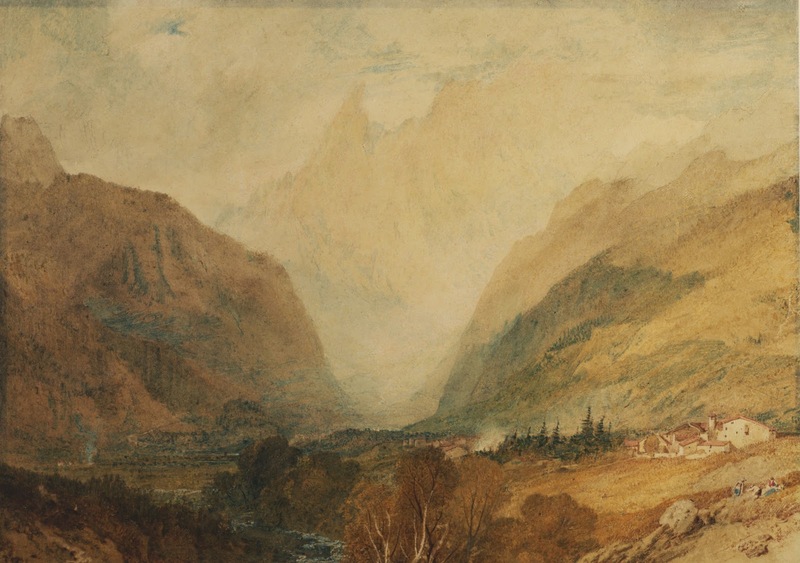 Some of the show's works were done in the British Isles, but Turner, for one, travelled to Switzerland to create some of the sublime pieces at the Morgan—Mont Blanc, from Above Courmayeur (1810), Pass at St. Gothard, Near Faido (1843), and On Lake Lucerne, Looking Towards Fluelen (1841? ), which borders on abstraction, it is so consumed by the interweaving of light, fog, and sea that looms ahead. These pieces presage the advent of impressionism and expressionism, and provide a firm link with high romanticism. They also depict a wary relationship with nature, warning of its power and ferocity. 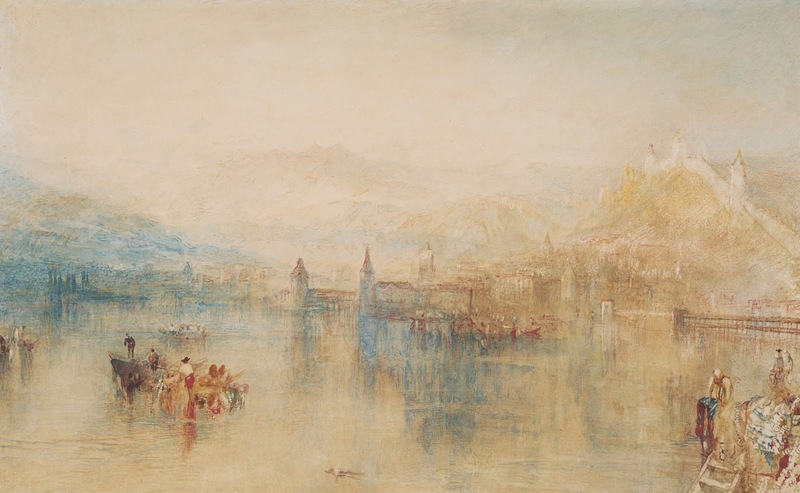 Another Turner, Lucerne from the Lake, 1845, very nearly shades into kitsch, with buildings reflected on the glassy surface, colorful boaters aforeground, mountains fading into the distant haze—again, a compatible view of nature and man. His technique is so facile, it's almost a distraction. And the label reveals how complex a process Turner actually followed: "Watercolor and graphite, some drawing into the wet paint with a sharp point and extensive scraping out." These are works on paper, don't forget. Who knows how much work went into his paintings. In any case, the Morgan show is well worth visiting, a refreshing whirlwind tour of exotic landscapes in one gallery. Also on view: Miracles in Miniature: The Art of the Master of Claude de France, examples of the great French illuminator whose tiny paintings are sublime gems of mastery and meaning (through September 14). If you're not in New York, the Morgan has online archives of the Prayer Book, and many other fascinating online collections—true treasure troves.